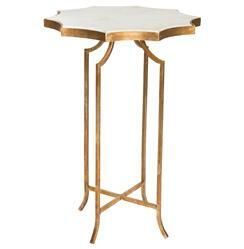 Our romantic, marble side table is exquisitely shaped and reflects your flare for eclectic entertaining. With petite proportions, it's perfect for cozy corners. The delicately designed antique gold leaf base contrasts with the heraldic shaped marble top.